Business Green vs Gold Delta SkyMiles Business: Which Amex Card Is Right for You? If you’re an independent contractor or a small business owner, you should get a business rewards credit card. Like their personal-card counterparts, these travel rewards cards offer great benefits and another option for earning points or miles towards free flights. American Express has a lot of great rewards cards, including several business cards. If you don’t want to break the bank with a big annual fee, but you don’t want a barebones no-fee card, you should consider the Business Green card and the Gold Delta SkyMiles Business. Both have a reasonable $95 annual fee that’s waived for the first year. Many people would probably assume that the Business Green card would be the obvious choice since it is part of the flexible Membership Rewards program, but the Gold Delta Business card also has a lot to offer. So if you often fly on Delta, or if you could switch much of your travel over to the carrier, it’d be worth considering both cards in more detail before applying. The first thing you’ll notice is that the Gold Delta Business card comes with a much bigger sign-up bonus. You’ll get 30,000 SkyMiles after spending $1,000 in the first three months of having the card. That’s only $333 a month. The Business Green card comes with only a 5,000-point sign-up bonus, though you get the full amount after your first purchase on the card. Delta’s 30,000-mile bonus is enough for a domestic round-trip ticket in coach. The Green card’s bonus will get you roughly $50 off a flight purchased through the American Express online travel center. As a part of the Membership Rewards program, the Green card is the clear winner for flexibility. Membership Rewards has 16 airline transfer partners, including Delta, British Airways, ANA, Air France, KLM, JetBlue, Virgin America, Emirates and Singapore Airlines. That means that you can transfer your points to any of those carriers and purchase flight directly through their frequent flyer programs. You have a lot of options, and if you do a little homework, you can easily maximize the value for your points. The Delta card earns SkyMiles, which can be redeemed with Delta. That doesn’t mean, though, that you can fly only with Delta. The airline is part of the SkyTeam, so you can fly on any of the 20 alliance members as long as you book your flight through Delta. Through Membership Rewards’ airline partners, you can book flights on all three of the major alliances: SkyTeam, Star Alliance and oneworld. Both cards have about the same earning potential. 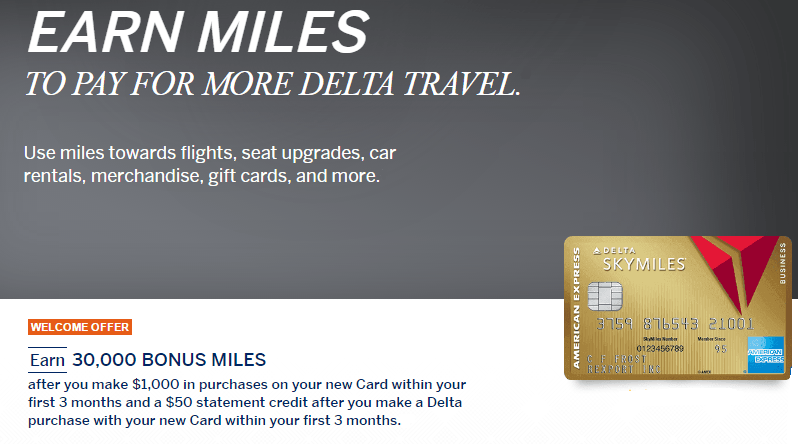 With the SkyMiles card, you’ll get double points on Delta purchases. With the Green card you’ll get double miles on purchases made through the Membership Rewards travel portal. Since you can purchase more things through the portal, like hotels and cruises, you’ll have more chances to earn bonus points with the Green card. You’ll get one point per dollar spent on all other categories of purchases with both cards. If you step outside the American Express business card lineup, you can get a better earning card at the same price point. For example, the Chase Ink Plus business card, also with a $95 annual fee, offers a remarkable five points per dollar spent on office supplies, phones, internet and cable TV. The Gold SkyMiles Business card offers a number of perks when you fly on Delta. You get a free checked bag, a 20 percent discount on in-flight purchases, priority boarding and discounted access to Sky Club lounges. The typical day pass costs $50, but if you’re flying on Delta and have the card you can get in for $35. You can also get a $50 statement credit if you make a Delta purchase within the first three months of card membership. That’s roughly the value of the Business Green card’s entire 5,000-point sign-up bonus. One thing the Green card offers that you won’t get with the Delta card is access to the Membership Rewards program. Through the Membership Rewards online travel center, you can pay for part or all of an airline ticket (or other travel) with points. As Amex business cards, both give you access to Open. In addition to offering online tools to help you manage your business’s expenses, you’ll also get two points per dollar or a five percent discount on purchases made with select partners, including FedEx, Hertz and HP. You’ll get the standard mid-level benefits with both cards, including purchase protection, trip cancellation protection, car rental insurance, emergency roadside assistance, lost baggage protection, a global assistance hotline and travel accident insurance. The Delta card has no foreign transaction fees, whereas the Green card charges 2.7 percent. The Business Green card is a lot more flexible than the Gold Delta Business card since you can transfer the points to 16 frequent flyer programs or simply buy travel through the Membership Rewards website. With the Delta card, you can only redeem for flights through the SkyMiles program. While it’d be hard to go wrong with the Green card’s redemption options, the SkyMiles card has more to offer if you fly on Delta. You’ll get 25,000 more bonus miles when you sign-up, plus a $50 statement credit. That’s more than enough for a domestic flight. You’ll also get a variety of Delta-related perks, such as a free checked bag and discounted lounge access. In my opinion, the only question you have to answer is whether you fly on Delta often enough to use the miles. If you do, I’d get the SkyMiles card.